URBANA, Ill. – If an in-the-flesh Extension specialist isn’t available to provide training, is a video of the specialist’s presentation or a video of a new agricultural practice a good substitute? 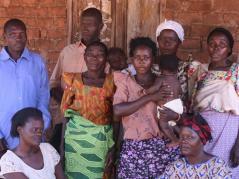 The answer, according to a University of Illinois study with farmers in rural Uganda, isn’t simple, particularly when gender is factored into the equation. This study explored the effectiveness of three training methods: traditional lecture-field demonstration; lecture and field demonstration plus video; and video only. A video about row bean planting was shown to groups of farmers in Kamuli District, Uganda. Because the study was trying to uncover gender knowledge gap issues, the groups that viewed the videos were all mixed men and women. The study found that the method that combined video and lecture-demonstration was significantly more effective in narrowing the gender knowledge gap. Watching video alone improved women’s knowledge scores but did not close the gap between them and their male counterparts. Interestingly, in terms of actual farming, Rodriguez said that women more often have the extra cash needed to implement a new innovation, and they make the decisions about what percentage of the household income will be applied to it. “Unfortunately, women’s contributions are not very well acknowledged,” she said. Rodriguez explained that in Uganda, 70 to 80 percent of the agricultural labor force is women, but they don’t typically have the access to resources and training opportunities that men have. Rodriguez said their study selected the video on how to plant beans in rows because it is needed to beef up the protein content of the Ugandan diet. And because the videos on row planting were already produced, it provided another opportunity to use them and in more remote locations. Rodriguez would like to do more in this area—testing the use of communication technologies that might make training easier, such as the use of animated videos. She’d like to test how the African audience will respond to animations as opposed to human presenters on videos. “The Ability of Training Approaches to Reduce Agricultural Knowledge Gaps between Men and Women in Rural Uganda” was published in an issue of the Journal of International Agricultural and Extension Education. It was written by Tian Cai, Michigan State University; Lulu Rodriguez, University of Illinois; and Eric Abbott, Iowa State University.